Blog » We Support Our Mums! Doncaster Council has launched its new We Support Our Mums scheme, a local initiative which encourages local businesses and community venues to show they are breastfeeding-friendly and reduce the stigma sometimes associated with breastfeeding. Last month I went along to Taste Eatery in Waterdale for the launch of the We Support our Mums Campaign. We all know that we have a right to breastfeed anywhere, however the reality is that a lot of mums don’t feel confident in doing so. I remember getting in such a flap trying to feed when out and about. I had a fancy breastfeeding bib-type thing, that I used to cover up as I didn’t feel totally comfortable with it. Particularly when I had a toddler and a baby, I found it difficult to entertain feeding the baby, whilst managing my then two year old when I was out and about on my own with them. So unless it was a baby group, where I could lean on other mums and friends for support, I generally didn’t go! 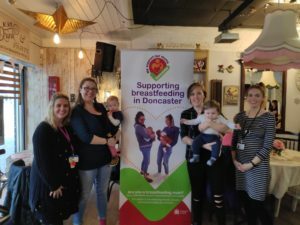 The new ‘We Support Our Mums’ scheme aims to make it easier for breastfeeding mums when out and about in Doncaster and the thing that I like about it, is the fact that employees at some participating venues (of which there are loads) have received training on how to create a welcoming atmosphere and make breastfeeding mums more comfortable. This can be something simple like taking them a glass of water or going to see if they need anything. I think this is great…we all know the cry of a hungry baby and having raced to a suitable place, by the time you’ve sat down, fed the baby, they then need a nappy change or something and you’re back up and out before having had a drink or anything! A simple gesture such as offering to bring over a drink (or in my case as a mum with two little ones, maybe bringing something for the toddler or locating some toys to entertain them) would have meant the world to me. We Support our Mums Champions can be identified as they will be wearing the We Support our Mums Champion badge. You can find all participating venues here and can filter by venue type. I filtered on places to eat and drink and various places are on the scheme, as well as Taste Eatery, including Rocco’s Italian Kitchen in Tickhill, The Toby Carvery – Bessacarr and Ziniz in Bawtry. The Lakeside Village is listed as a participating venue too (see our previous article about the Lakeside’s fantastic baby changing facilities!). This list is expanding and if you have a business and would like to sign up for the scheme, click here.